(by Mark Prigg and Richard Gray, UK Daily Mail) – The US Defense Advanced Research Projects Agency (DARPA) has given the go ahead for four defense contractors to begin building “Gremlin” drones. Darpa said the program has been deliberately named Gremlins after the imps that British pilots adopted as their good luck charms during Wold War Two. Composite Engineering, Dynetics, General Atomics Aeronautical Systems and Lockheed Martin will develop the drones. The program envisions launching groups of Unmanned Aircraft Systems (UAS) from existing large aircraft such as bombers or transport aircraft – as well as from fighters and other small, fixed-wing platforms – while those planes are out of range of adversary defenses. When the gremlins complete their mission, a C-130 transport aircraft would retrieve them in the air and carry them home, where ground crews would prepare them for their next use within 24 hours. The gremlins’ expected lifetime of about 20 uses could provide significant cost advantages over expendable systems (such as missiles) by reducing payload and airframe costs and by having lower mission and maintenance costs than conventional platforms, which are designed to operate for decades. 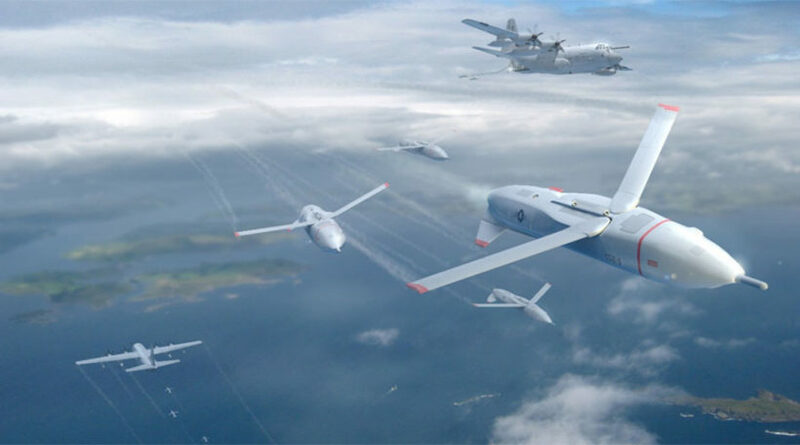 “We’ve assembled a motivated group of researchers and developers that we believe could make significant progress toward Gremlins’ vision of delivering distributed airborne capabilities in a robust, responsive and affordable manner,” said Dan Patt, DARPA program manager. The idea is to replace the expensive and increasingly vulnerable multi-function combat aircraft which currently perform a range of different missions. Instead they propose deploying from the air smaller unmanned aircraft, each with different capabilities, to perform a mission before retrieving them mid-air so they can be used again. Not only would the concept remove the risk to pilots by keeping them out of the front line but it would also drastically reduce the cost of each aircraft. The Gremlins would be launched in mid-air from larger aircraft and then retrieved in the same way. The agency is hoping to build on its automated mid-air refuelling technology alongside the sea based platforms for capturing drones as they come into land. In its briefing, the agency said it hopes that by using cheap drone aircraft it would be possible to overwhelm the increasingly sophisticated defenses of enemies. Reprinted here from London’s Daily Mail for educational purposes only. May not be reproduced on other websites without permission from the Daily Mail. 2. On what current technology does DARPA aim to build? 4. What effect is the use of cheap drone aircraft expected to have on our enemies’ defenses? 5. Watch the video under “Resources” below. What is your reaction to this newest military strategy? (surprise, amazement, encouragement…) Explain your answer. 6. What do you think the military’s motive is for publicizing this program to our enemies? Will this cause other militaries to attempt similar programs to use against the U.S.? Explain your answer.